What is a potluck ? 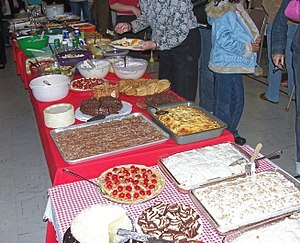 A potluck is a communal gathering where each guest or group contributes a different and hopefully unique, and often homemade, dish of food to be shared. At Lille café polyglotte we organize the first Wednesday of each month a potluck. please come and bring your friends !